Everyone knows it is difficult to get a new website to rank online, SEO's prefer not to take on brand new websites, it is often better to leave a new site for a month or 'three' to allow it some time to gain Google's trust. But I can't wait! - Ok, then here are some tips to explain how to get a new website to rank online and to start to migrate through the major search engines like Google, Bing & Yahoo. 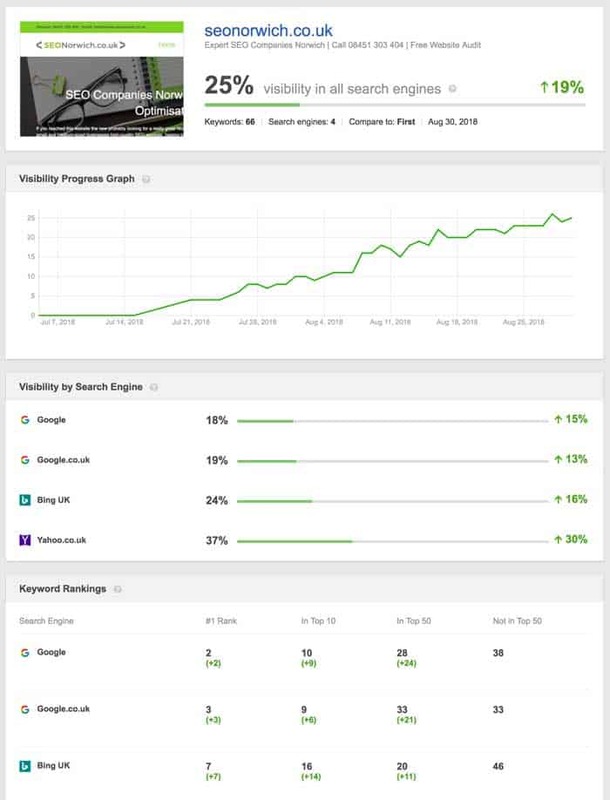 This example shows how we got our own website to rank after launch, in just less than one month. We now have 11 top 10 rankings and 18 top 20, progress has been fantastic. 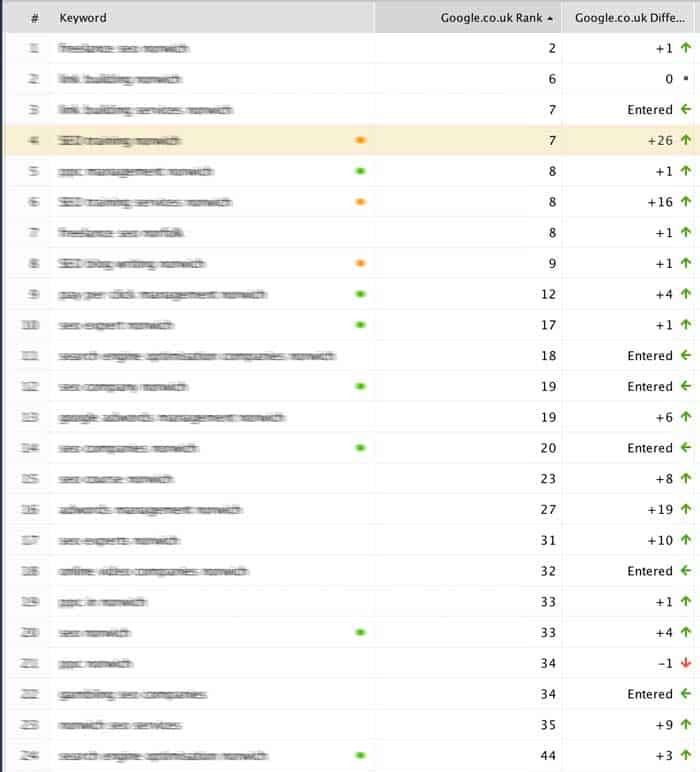 Exceptional results are possible if you use some of the seven tips on this page, but if you really want to rocket then let an SEO Agency or freelance consultants like SEO Norwich handle this for you. Sounds obvious, but it is surprising how many new businesses come to us and say not all of my pages are on google. We check this as part of your FREE Audit. Again, unless your host or website company have added tracking codes to your site for you or on a server level, how can you expect to really know what's going on around your website. So, we recommend adding google analytics and bing analytics as well. Once the data has been processed for a month, you and any respective SEO expert can then understand and interpret the data properly. Once you have the sitemap in place and tracking code, then log into google console and bing analytics to tell the search engines to come and index your pages, posts and images. Add your website to a selection of great quality directories. But directories are dead aren't they? - Nope! The help to establish your authority, not especially from the direct value as Google is wise to volume directory submission, but what directories do are drive referrals and help locate your website in the world. Here is a great article to explain the benefits of directories. Don't forget to optimise your pages, H1 tags and Alt text on images will provide positive signals to Google and other search engines. If you need help with your search engine optimisation then SEO Norwich should be your chosen partner. Post articles to keep the Website Bots well fed with content, which in turn helps to drive the frequency of return from the Bots. This means that pages are cached more frequently so any changes you make are picked up more quickly and adjustments to your site impact more quickly. Mobile first was rolled out in 2016/17 and Google provided enough warning to help companies understand this preference and the reasons behind it. Mobile users to no want heavy, slow loading sites as their experience is hindered - We also know that 3G and 4G speeds can vary so this has lead Google to sharpen its allegiance to snappier websites using faster loading languages and scripts. Image compression, this supports site speed but loading heavy or HTML controlled image sizes used in WordPress and other CMS systems are not great for user load times. - Include an image to support an article or subject show the results or link to a citation this all helps, but choose well and optimse the quality for websites.